When Luther, the Reformer, went head to head with the church establishment and won (at least in Germany); he accidentally-on-purpose became the establishment. I’m not totally sure he was ready for the power or responsibility; most of the stuff he’s infamous for, rather than famous for, came after he’d replaced the Catholic Church as the authority. 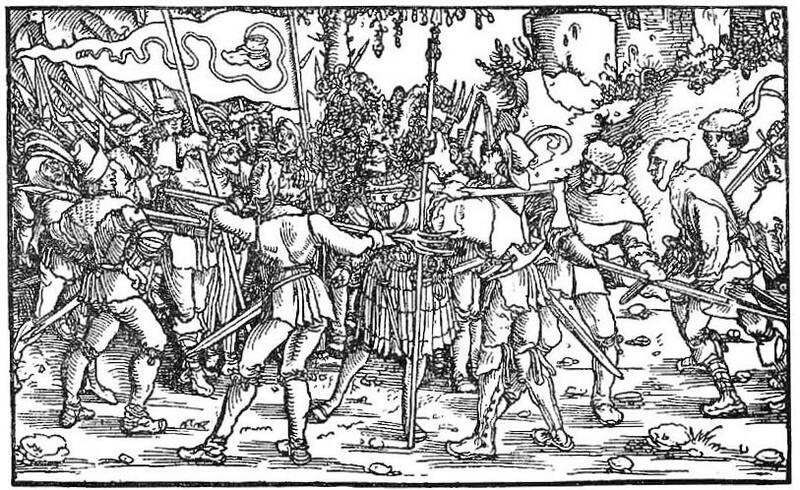 Which is almost precisely what the church wanted to do to him… and here he is backing those who use power, possibly those who abuse power, with a theological justification, saying Christians should “suffer injustice, not to seize the sword and take to violence”… Luther added the authority of his voice against the cause of reform elsewhere… political reform. He was a certain sort of establishment… Then people within the Reformation movement started to disagree with each other and using the mechanisms of the new media technology at their disposal (the printing press) to publish against one another, and things got a bit worse (so Luther called Zwingli his ‘Judas’ after he and a bloke named Carlstadt started publishing pamphlets against him and then things got really ugly) and it was clear that in some ways Luther viewed himself as the new church establishment in Germany. He’d reformed and ‘democratised’ the church; but had maintained some of the institutions and power dynamics of the church establishment he replaced. Questions of authority are vexing amidst questions of reform; especially when new media technologies give new power to voices that don’t want to conserve the status quo, or establishment, but challenge it. So in all the conversation around questions of authority and the blogosphere; conversations about something like a new technology driven reformation, in conversations about how we, the church, approach publishing/teaching on the web, we need to ask: what are we going to replace the establishment with? What will the new establishment be? How will it be different? Who will it marginalise even as it empowers others who have been marginalised? Social media is a ‘new media technology’ — and it’s really where the democratising power of the Internet is finally starting to bite into establishments that are less democratic. In the analogy with the peasant’s revolt (or any revolution aimed at democracy) the traditional establishment media represents a concentration of power and influence in the hands of the few; the aristocracy (the company owners) and their nobles (the journalists). 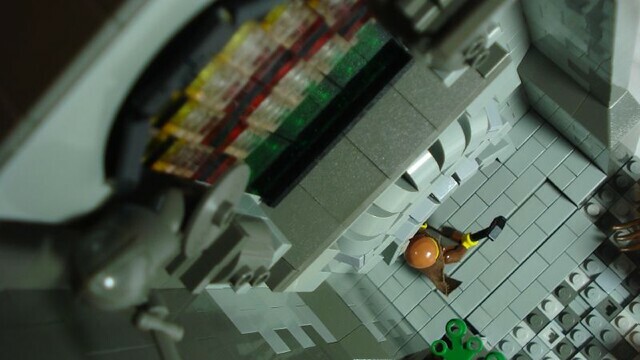 While this is a follow up to my last post which is about the state of the Christian blogosphere and the question of ‘authority’ in this new media landscape and the social media lead reformation, there’s an analogy to consider between how social media is changing church power structures, and how it is changing establishments outside the church, particularly in the media. Traditional media empires are falling to pieces (eg Fairfax) because they can no longer profit in this new landscape; they have been disrupted. The establishment is dying. The problem is they haven’t yet been replaced with anything better. Citizen journalism and social media (a democratised platform) can produce a political movement like the Arab Spring (and that’s being damned with faint praise), and can produce an Obama presidency and then a Trump presidency. Citizen journalism, or the loss of power of ‘establishment authorities’ like the traditional mainstream media (the ‘institution’ or the press as ‘an estate of the realm’), also gives rise to ‘fake news’… because the fragmenting of media companies means that professional standards, regulations, and codes of ethics are out the door, and even the legal protections like defamation laws are less effective because the cost of going after a blogging operation running from a bedroom isn’t really worth it (like it might have been against a media outlet operated by News Ltd). It opens up the ‘publish first seek forgiveness later’ mentality, and removes the burdens of fact checking and source confirmation and all sorts of things that have protected us as an audience, but also given authority to particular established outlets. Season three of Aaron Sorkin’s The Newsroom grappled with this tension beautifully. Here’s a great clip. It’s actually based on a real world example. That’s the line offered by the voice from the margins — the voice seeking to challenge the establishment and the role of authority, the creator of ACNgage. And it’s almost the voice that says ‘the market will decide who is worthy of having authority’ coming from the new reformers. For those of us who are idealists about what role the media might play in transparent and accountable politics, this is diabolical in the sphere of the press; but for those of us wondering about Christian voices and authority in the social media world there’s a word of warning here; can we afford to be so blasé about truth and the idea that it’s ‘people’ as readers who have to do the work of discernment? Do we really want to, in a rush to democratising the web using egalitarian (in the broadest sense, not the ‘technical’ term within Christian debates about gender) technologies really want to do away with all institutions (and credibility and expertise and accountability and ethics) to let populism rule? In my idealistic wannabe journalist phase I was schooled to believe that what the public is interested in is not the same as what is in the public interest; the idea that journalists have a gatekeeping role to play when it comes to deciding what qualifies as news. The problem with our modern news institutions is that they’ve become more interested in serving up what we think we’re interested in at the expense of what we should be interested in in order to live in a flourishing society. 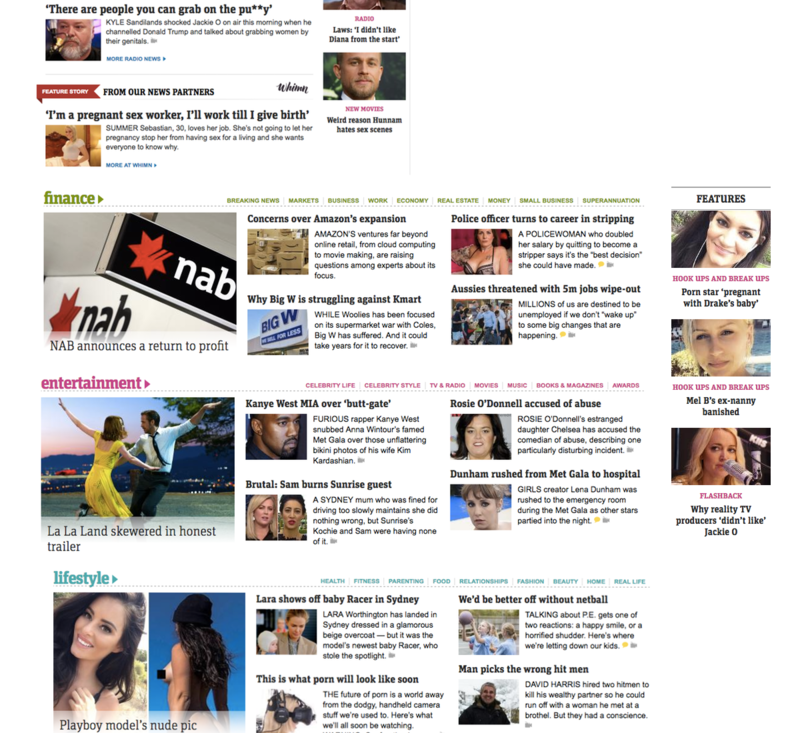 Here, for example, are some of the stories from the news.com.au homepage last week. How ‘Police Officer turns to career in stripping’ is a finance story escapes me; but these are stories that are designed primarily to entertain and titillate; not to inform the public about things that are important for the common good. This little picture of a ‘media institution’ in the new media landscape makes a very good case for democratisation and reform; so long as we replace it with something better — not just a thing that gives our itching ears a good scratch. Reform could be a really good thing for the media; but I’m not so sure the ‘blogosphere’ or ‘citizen journalism’ is the answer to this problem. I’m not sure that bad institutions are a reason to do away with institutions altogether. If the media we consume shapes our common life, and is part of what helps us flourish as societies, then I’m not sure we’ll be richer without institutions. We just need different institutions that are able to harness the good parts of new technology without an overcorrection. Which is harder than it stands; because most revolutionaries are functionally aggressive monotheists (our way is the way), not pluralists (we want to make space for multiple ways held in tension); we want total victory over the other, especially when the other has been oppressive and there’s a sense of justice. The natural tendency of reformers is to replace; to fill the power vacuum you create by overthrowing the old system. That’s why in some revolutions the establishment get beheaded. A power shift from the few to the many, without considering some of the limits of power that the ‘few’ faced (or ideally faced) that the many won’t, will be dangerous. While institutions can be terrible and corrupt and serve fairly narrow agendas, this does not mean that all authority structures are equally terrible. It’d also be naive to think that no structure but the totally ‘democratised’ audience is the best option; this is already happening in the traditional media; the media that is market driven gives the market what it wants rather than what it needs; it aims for excitement, entertainment and titillation rather than information for formation. The same sort of naivety that leads to the death of expertise in stuff like direct democracy political parties; populism is a terrible master. It’s funny that populism and the rise of fake news gave the US a Trump presidency, but Trump is so keen to be ‘anti-establishment’ that he’s calling the establishment media fake news… In a democratised platform we, the people, are responsible for deciding what behaviour is ethical, acceptable, and in our interest, we, the people, are responsible for deciding what content deserves a wider audience. The power is in our hands; and so questions of how to place limits on the power of the mob are worth staring down. It’s possible Luther was a bit right about the revolting peasants, even if democracy is actually a really great thing, and even if his motives were a bit questionable. We don’t want the reformers to become the new establishment to wield exactly the same sort of power against their opponents as the previous establishment. We want to, I think, figure out how to create democratic institutions that have a clearly articulated platform, a clear code of ethics, and external (perhaps legal) accountability; but also an understanding of what these democratic platforms must do for the voiceless (they should give them a voice). New mediums lose lots of this stuff by their democratised nature; but they gain the ability to give a voice to those who have otherwise been voiceless (which is why they’re usually quickly adopted, or even developed, by the marginalised who are pushing for systemic reform). New mediums put more control in the hands of the audience/market than ever before; a platform itself isn’t enough; you choose what you read; but then you have the opportunity to become a contributor (by commenting), or a publisher (by sharing to other social media channels, or by publishing your own response elsewhere). The new establishment is fragmented; and authority now comes more from the audience than the platform. Some people are responding to this by producing new media platforms (Gawker, Buzzfeed, etc and Buzzfeed founder Jonah Peretti’s stuff on new media (linked to in this old post) is worth reading if that stuff interests you). This new media is inevitably and inherently democratic, it will, as I suggested in my last post, favour the anti-establishment side where that side has not been perceptively inclusive or democratic; and the side arguing for the equality of all voices (a true ‘priesthood of all believers’) against a narrow priesthood… much as the printing press favoured the reformers and aligned with their framework. If you give everyone a voice with a new technology, it’s those who’ve been marginalised who (historically) who’ll be the quickest to pick up the new technology (if not to develop it in order to serve their agenda). Maybe rather than being egalitarian we should be those who act to amplify the voices of those the world seeks to silence; even if those voices say things we disagree with, because we recognise the dignity and equality of those people too; this is what real democracy looks like anyway; not populism or a level playing field so that the meritorious can rise via the mechanism of the audience-as-market. Part of the solution for surviving and thriving in the digital world is good content. Content that is virtuously good in the public interest/geared towards human flourishing sense, but also content that is good because it has credibility, and integrity, and a demonstrable commitment to an ongoing reputation. There’s a degree to which this means good content probably comes with some sort of connection to real world accountability structures rather than with no regard to things like the law and ethics (see the videos above), as Christians it probably means we ought to have some declared connection to a doctrinal framework or church community so that people know where we are coming from as they assess the content. But it’s not enough that the content simply be good; newspapers (apart from News Ltd papers) still produce good content, but they’re dying (so too, the content produced in the newsroom in The Newsroom). This content also needs to be truly social or liquid; part of the new media landscape is the idea that people are publishers not just readers, and publication (be it comments, responses, etc should be as frictionless as possible), and part of being democratised might actually be opening up our platforms to voices we might otherwise naturally exclude (in this case the call is coming from women, who are quite capable of producing their own compelling platforms and gaining a hearing, but perhaps it’s also non-tertiary educated Christians, youth, people from non-english speaking backgrounds etc). We Christians are pretty good at setting up our own parallel (but lamer) institutions; so where in the past Christian publishing (particularly in Australia) was often closely tied to book publishing arms of denominations, we’ve now embraced the frictionless environment of the web. Where once we had our own newspapers and printed journals now we have websites as well; content portals or platforms that operate as ‘establishments’ that provide a sort of accountability, ethic, and authority to the content they produce. So we have newer properties like The Gospel Coalition, and Thinking Of God, and evolving properties like Eternity and Gotherefor; of these four I think Eternity is the closest to operating with the ‘social’/democratic nature of the web in mind (even as they employ an editor and journalists and maintain a reasonably high standard for their in house production). The Centre for Public Christianity is another interesting beast that seems to aim to contribute to the secular media rather than operate as a parallel institution (which I think is actually a much better model). But none of the other platforms in the Australian Christian blogosphere (coming out of, or seeking to play as, the establishment) are nailing this (in my humble opinion as a reader/writer/social media user with some professional expertise with the media). We’re far too wedded to the little priesthoods we’ve created — the priesthood of the educated; the priesthood of the male preacher; the priesthood of the large platform/personal brand; the priesthood of the polymath-styled genius/public intellectual who we’ll put up to talk about anything and everything because of who they are (and who they know). In my final post in this little mini-series I’ll consider the Gospel Coalition, Thinking of God, and Eternity as little case studies of this theory and show how only one of them seems geared for survival if the reformation the online conversation about women, ‘teaching’ and the Christian blogosphere is as important as it seems to be to me (as a reader of it, but also as a pastor of a church with plenty of women who say things worth hearing). If the revolution is coming, we do actually need to figure out what authority and accountability look like; these aren’t illegitimate questions to ponder. We need to figure out what the establishment is going to be replaced with. 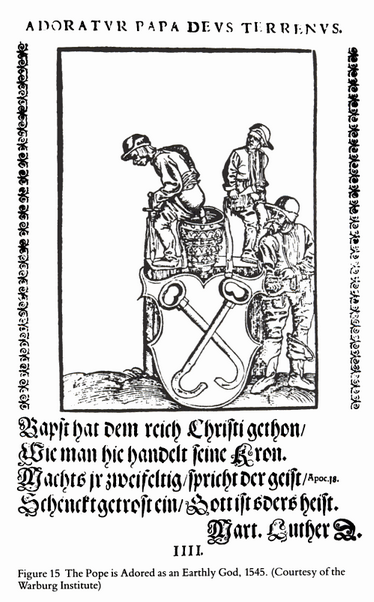 I just finished an essay about Luther’s life, with a particular emphasis on his use of the 16th century’s equivalent of social media – the propaganda pamphlet. It was fun. I read a couple of biographies (including this one). He was a pretty cool guy. Here’s some stuff I think is worth sharing. 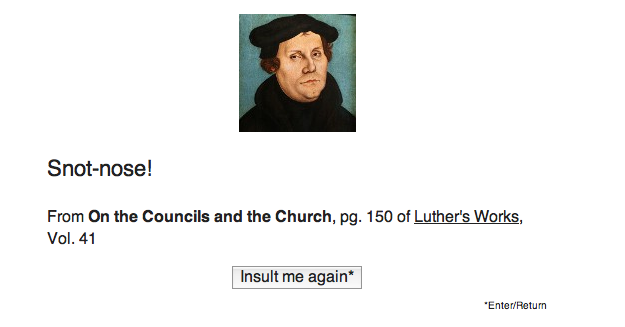 Luther didn’t like the pope much. This is some guys relieving themselves in his hat. 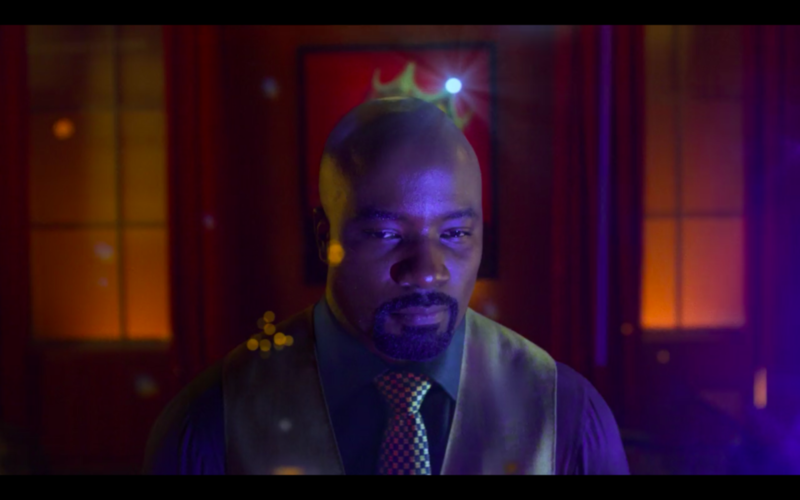 At one point, when the emperor declared him an outlaw, Luther was “kidnapped” by some friends and hidden in a castle. He grew a beard. When some bad stuff was going down in his home town he travelled back there as a spy, in disguise. Later, when he was heading home after his castle exile ended, he went to a pub and had this conversation with two guys who rocked up while he was there. At least this is how he tells the story. Luther – Good evening, friends. Draw nearer and have a drink to warm you up. I see you are Swiss ; from what part do you come and whither are you going ? Kessler – We come from St. Gall, sir, and we are going to Wittenberg. Luther – To Wittenberg ? Well, you will find good compatriots of yours there, the brothers Jerome and Augustine Schurf. Kessler – We have letters to them. 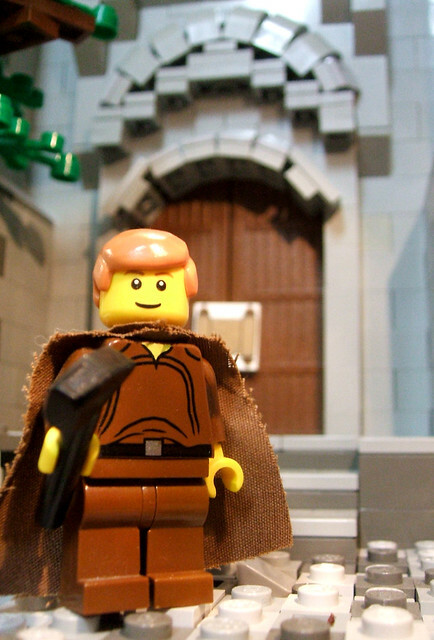 Can you tell us, sir, whether Luther is now at Wittenberg, or where he may be ? Luther – I have authentic information that he is not at Wittenberg, but that he will soon return. But Philip Melanchthon is there to teach Greek, and Aurogallus to teach you Hebrew, both of which languages you should study if you wish to understand the Bible. Kessler – Thank God that Luther will soon be back ; if God grant us life we will not rest until we see and hear that man. For it is on account of him that we are going there. We have heard that he wishes to overturn the priesthood and the mass, and as our parents have brought us up to be priests, we want to hear what he can tell us and on what authority he acts. Luther – Where have you studied formerly ? Luther – How goes it as Basel? Is Erasmus there and what is he doing? Kessler – Erasmus is there, sir, but what he does no man knows, for he keeps it a secret. (Aside to his companion as Luther takes a drink) I never knew a knight before who used so much Latin, nor one who understood Greek and Hebrew as this one seems to. Luther – Friends, what do they think of Luther in Switzerland ? Kessler – There are various opinions there, sir, as everywhere. Some cannot extol him enough, and thank God for having revealed truth and discovered error by him ; others, especially the clergy, condemn him as an intolerable heretic. Spengler – (Raising book which he sees is a Hebrew Psalter) I would give a finger to understand this tongue. Luther – You must work hard to learn it. I also am learning it, and practise some every day. 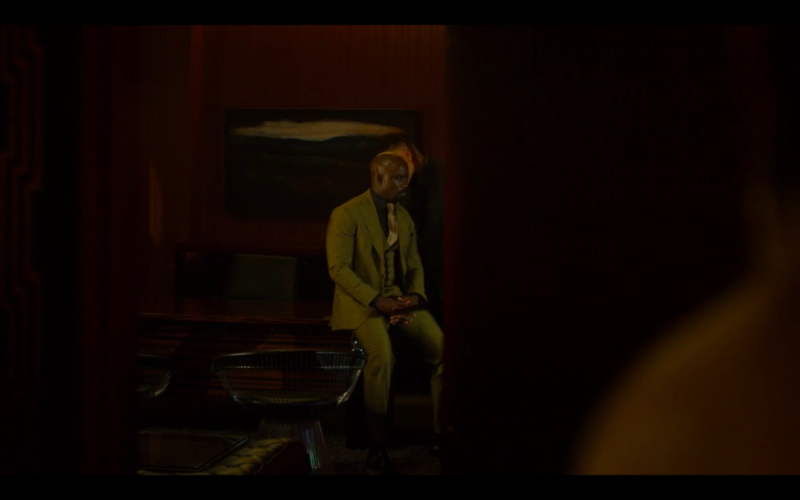 Host – I overheard you, gentlemen, talking of Luther. Pity you were not all here two days ago ; he was here then at this table, sitting right there (points). Spengler – If this cursed weather had not hindered us we should have been here then and should have seen him. Is it not a pity ? 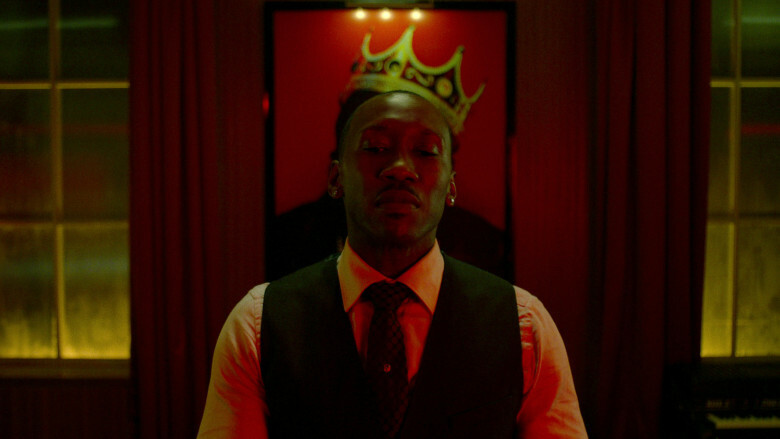 Host – (aside to Kessler) Now that I see that you really want to hear and see Luther, I may tell you that the man at your table is he. Kessler – You’re just gulling me because you think I want to see Luther. Kessler – (whispering to his companion) The host tells me this man is Luther. Spengler – What on earth? Perhaps he said “Hutten”; the two names sound alike, and he certainly looks more like a knight than a monk. Luther – May I ask, friend, what you are reading ? Merchant – Doctor Luther’s sermons, just out ; have you not seen them? Luther – I shall soon, at any rate. Host – Sit down, gentlemen, sit down ; it is supper-time now. Luther – Come here, gentlemen ; I will stand treat. (The merchants sit down and supper is served.) These are bad times, gentlemen. I heard only recently of the princes and lords assembling at Nuremberg to settle the religious question and remedy the grievances of the German nation. What do they do ? Nothing but waste their time in tournaments and all kinds of wicked diversions. They ought to pray earnestly to God. Fine princes they are ! Let us hope that our children and posterity will be less poisoned by papal errors and more given to the truth than their parents, in whom error is so firmly implanted that it is hard to root out. Host – (to students) You owe me nothing ; Luther has paid it all. Kessler – Thank you, sir, shall I say Hutten ? Luther – No, I am not he ; (to host) I am made a noble to-night, for these Switzers take me for Ulrich von Hutten. Host – You are not Hutten, but Martin Luther. 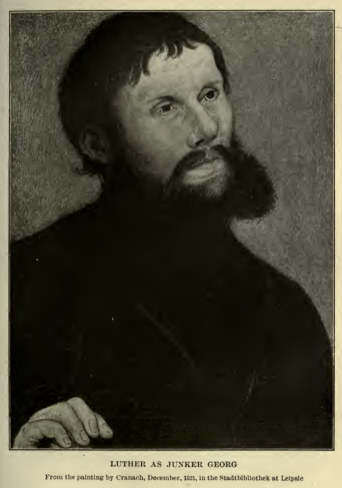 Luther – (rising to say good-night and offering them his hand) When you get to Wittenberg, remember me to Jerome Schurf. Kessler – Whom shall we remember, sir ? Luther – Say only that he that will soon come sends his greetings. I’m writing an essay at the moment about Luther. This explains the relative paucity of posts this week, and other essays are to blame for the last two weeks’ relative absence. I’m currently working on an essay on the Reformation. When I say currently, I mean for the last four hours I’ve been finishing my reading with just a few more articles. No seriously. Just a few more. And on Tuesday I’ll write my thoughts into something cohesive, which will then be submitted by Friday. Anyway. I’ve been enjoying reading some of the polemics written around the period of the Reformation. And while I probably owe much of my theological heritage to John Calvin, as a Presbyterian, I find Luther resonates a bit better with my personality, as a young hot-head blogger. Anyway. 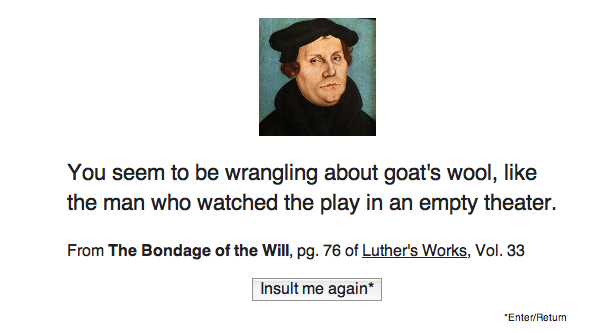 The Luther Insult Generator has been doing the rounds online. Its popularity led to a server change, and thus a change in web address. So. Update your bookmarks. Snot-nose. Calvin is famous for his slightly misattributed and grossly misunderstood “five points of Calvinism” – I’ve got a reputation for being “not a five point Calvinist” mostly because I don’t like hyper-Calvinism. Calvin was mostly terrific – having done some research though I can’t say I’m fully on board with his philosophy of government. Here are some things I learned about Calvin this week that I thought were interesting. Calvin wrote some stuff under a pen name to avoid persecution from the established Catholic church – including Charles d’Es-perville, Martianus Lucanius, Carolus Passelius, Alcuin, Depercan, and Calpurnius – these would be good names to consider for your children or characters in a novel if you’re staunchly, but secretly, reformed. Calvin was, by nature, incredibly humble – he wanted a life of quiet scholarship. He requested an unmarked grave. He was pastorally sacrificial. He submitted all things to the sovereignty of God. He championed a doctrine that made human agency incredibly small. He instituted a political system in the city whose church he lead removing power and authority from the church and putting it in the hands of the people. The idea of having a theological movement named after him would have been an anathema. It seems to me that this aspect of his character is in stark contrast to the pillars of the “new Calvinism”. Calvin was, by nature, incredibly arrogant. He was so incredibly confident in his personal views on scripture and Government – and did not particularly like opposition. God seems to prefer to work through guys who are an incredible paradox of confidence and humility – I’m not sure that humility and arrogance are the polar opposites people suggest. They seem to be two separate characteristics with related distinctives. Calvin was politically savvy enough to know when not to be political. This greatly enhanced his influence on the political sphere. When Calvin returned to St. Peter’s Cathedral in 1541, he unceremoniously but symbolically resumed his pulpit activity by expounding the Scriptures at the exact verse where he left off prior to his exile. Several days earlier, Calvin had consulted with the Small Council, the real political powerhouse of the day, and encouraged them to make important reforms. They were so willing to help him in the Reformation of Geneva that they not only approved his proposals to revise the protocols for church order, but they also appointed him to a committee to design a constitution for the Republic of Geneva. Calvin’s post-reformation political realignment of Geneva pioneered the separation of church and state, and the separation of powers. His restructuring of Geneva’s government removed power from the head of the church to a church council, and to a separately elected government in the city. These groups functioned as checks and balances. He separated government of the city from the church to protect the church from the interference of the government and the wealthy – not the other way around. Calvin practiced what he preached. A consistency of ideals, both in church and state, permeated his thought and action. He was prudent enough to realize that the best way to reform the culture was an indirect one, i.e., to first reform the church.